.....Or is someone you care about in one? You may be in pain and think you should leave, but your heart hasn't figured it out yet. Logically, you don't like what is going on, but you still love your partner. You may wonder if your relationship is even worth saving. If you are in a relationship with a toxic individual, you have been trained to put their needs first. You have probably spent years putting their needs above your own. It may even be uncomfortable to consider putting YOU first. However, the dynamics of your relationship will change only when You learn to do this. Toxic people are often extremely narcissistic and everything is about their needs and their wants. You both spend your time serving their needs while, YOU grow more INVESTED in the relationship (because you are "serving" them). Yet, as you serve them- they grow less "vested" in the relationship... and even show you less respect for your efforts (exactly the opposite effect of what you would think would happen). Does your partner try to control you? (i.e. tell you what friends you can have, where you can go, what you can do, or do they control you with money). They may be so narcissistic they justify "serving their needs" by having an extra-marital relationship? These are each ways that toxic partners assert power and control over you. I've been a divorce attorney for 24+ years and I've seen what a toxic person can do to a relationship (in spite of their non-toxic partner's best efforts to improve the relationship). Even if a non-toxic spouse makes the changes their toxic partner requests- ....it is still not enough to bring peace to the relationship! Eventually, the non-toxic partner becomes exhausted from trying to be "perfect", and from trying to do anything and everything to bring sanity to their home. Toxic people are "Takers" in the relationship. The acceptance and praise you seek for your sacrifices will go unacknowledged. Toxic partners are incapable of giving back-......that is, unless they want or need something at the moment. Changing your relationship can be difficult,- ...sometimes impossible. It is important you learn how to recapture the strength that has been stripped from you. You may not even realize how your relationship has altered YOU. Once you take back the controls in your life,- and once you see how a part of YOU has been surrendered daily to keep your toxic partner from jumping on their "roller coaster" and taking you on another emotional, chaotic ride, and once you learn how this happens, it will change your life and your relationships forever. You will become healthy minded - and Empowered Again in any relationship you enter. Staying with a partner that devalues everything good about you-... keeps you stuck. You get weaker and weaker... until you may not even recognize or like whom you have become. It's time to change your situation. If you allow me to, I'll take you on an incredible journey into the world of Toxic Relationships, the information is told through other people's true life stories. It is a very easy read, and a straight forward and easy-to-understand book, but it will have a tremendous impact on your thinking. You can regain the self-respect you lost along the way. If you could solve it on your own- you would have a long time ago. You need a mentor, and you're not alone in the journey. We are here to help you each step of the way. How to Regain Lost Power in Your Relationship. 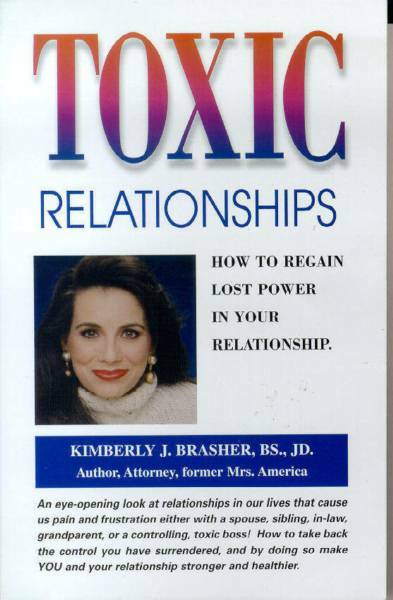 Hello, I'm Kimberly Brasher, and in 2001, I wrote Toxic Relationships, which was completed and published in 2003. I wanted others to see what I saw from my side of the desk as an attorney, and to improve their lives and relationships by having this valuable information. 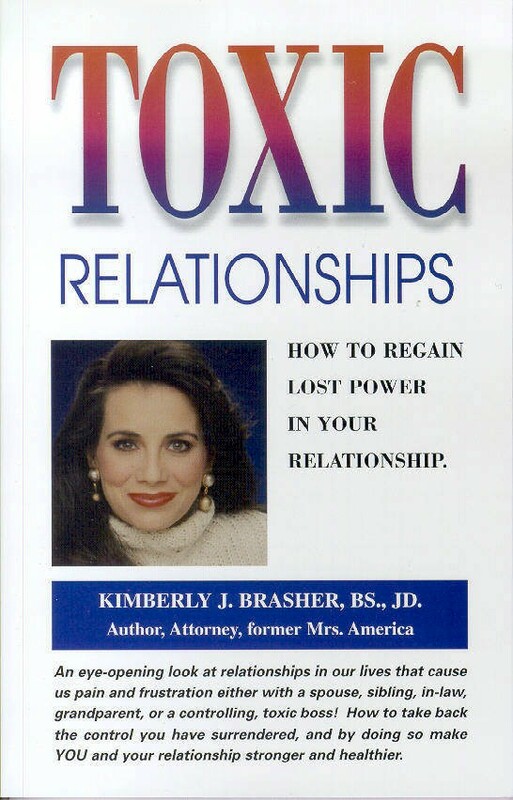 Since I coined the phrase "Toxic Relationships"- and wrote this book- many, many lives have been changed for the better. Once you have read Toxic Relationships, RED FLAGS will go up whenever you are around a person who has toxic behaviors- whether they are directed at you or at others. When you begin to see toxic people for what, and who, they are- you won't simply "dismiss" or excuse their actions. Toxic personalities believe they are doing what is in the best interests of the relationship. Strangely, in their minds they think they have to be in ultimate CONTROL of every aspect of your life to keep you where they "need" and want you to stay. Toxic personalities create an unhealthy environment for a "lasting relationship". Toxic people have learned, and been taught, how to serve and dote only on themselves. As a result they are unable to give others what they can't give themselves- unconditional love. Toxic people are very self-absorbed and narcissistic in every way, and act full of themselves and prideful- but it is all counterfeit to their true, embedded feelings of inadequacy and inferiority. Their greatest fear is rejection so they refuse to love fully and stay guarded. They only feel comfortable when they are "taking". They take, and take, and take without giving back to the relationship unless it serves an immediate purpose for them. How can I change my role in this relationship? How did I get myself into this mess of a relationship? What should I do now, stay or leave? Is my relationship over or not...? Will I be able to have a healthy relationship with another? How can I change my selection process to find a good relationship for me next time? Am I part of Our problem? What role do I play in my own problem, if any? Can this relationship be fixed? Should I even try? Kimberly has been teaching and consulting for over 30 years both on a national and local level. She has been a family law attorney for approximately 24 years now. 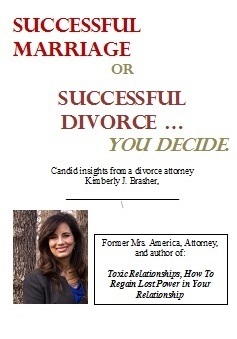 This book was written so others could benefit from what Kimberly sees from her side of the desk. The information is insightful, liberating and life-changing. A great step into the light. 13. Deny what they said before,...They lie easily, then deny it. 14. Won't acknowledge or praise the accomplishments or efforts of their partner. 15. Despite all your efforts- you will still be accused of not supporting them. Each of us knows what real love feels like and how good it feels. In a Toxic Relationship it is like you are living with an enemy. Someone who fights against you instead of for you. "Words seem so inadequate to express what your book has done for me and my life, but thank you anyway. I thought I was the only one going through this. I feel so much better- I'm reading it for a second time now." Decide whether or not your relationship is worth saving. Learn Empowerment Skills to stop the pain you feel and turn your relationship around. See why toxic people may be attracted to you. Start today to become happier by taking back charge of your life. Do you ever feel like you are going crazy in your relationship? Or that reality seems to SHIFT daily? Are you made to feel if you had just done,.... A, B, C, D, or E, The conflict could have been avoided? So initially, you accept that argument and you work hard to carefully change or "fix" your behavior and you are careful NOT to do A, B, C, D, or E, yet you still get criticized by your toxic partner. You still get "in trouble". Next, you are told you should have done ....L, M, N, O, or P.
Eventually, you find that all your changes are never enough. Your Toxic partner is re-writing history. It is a form of verbal abuse to control you. Read and learn how to protect yourself from this in the book, Toxic Relationships, How to Regain Lost Power in Your Relationship. A Better Life Publishing Company, LLC. "Here is my new email. I can't wait to read your new E-book. This one has helped me so much already." "Thank you, thank you is all I can say. I was starting to think I was crazy. Nothing I did seemed to fix things. He just kept getting more mean and more controlling. Now I have found strength in me, and am making changes." you learn to spot the pattern of Toxic people. Once you see the red flags shouting to you, "Run, Run" -you will begin to seek and find healthier connections! Arm yourself with the knowledge you need to choose a healthy, new relationship. No matter how many changes you make to perfect yourself and to be all the things your partner says are wrong.......IT STILL WILL NOT BE ENOUGH! You cannot make your partner HAPPY- and it is not your job. Happiness comes from inside of a person and is a reflection of their hope and faith in people and in themselves and in God. All of these things are things an individual has to do for themselves and is not something you can do for them. People seem to take their happiness or their sadness with them wherever they go. You are only in charge of the type of person YOU are, and you are not responsible for the type of person your partner is. If you choose to leave- leave respectfully. Do it with the highest measure of honor so you will be able to feel better about yourself. If you stay embroiled in ugly, legal battles it will destroy your life. Who was the author of the thought, "Insanity is drinking poison.....and wishing someone else would die from it!" Too often this happens. Instead, be respectful in all your dealings with your X-partner so you will have greater healing and a greater chance of growth and progression moving forward. In my practice I have noticed those that seek revenge and wish illness on another who keep going back to court end up stagnant and stuck in their lives. They lack progress or happiness in their lives too. If you stay in your Toxic relationship past the point where you don't like whom you have become, or perhaps become angry or bitter and lacking happiness yourself, or lacking faith in yourself and in others and not hopeful that tomorrow will be better than today- Seek Professional Counseling Services to help you talk through the pains you have experienced in your toxic relationship. If you lack the resources or ability to get professional counseling, at least buy a notebook and WRITE everything down! Writing down all of your pains and sorrows will get them OUT. Once you get them out you will be able to move on and build better relationships for your future. Don't allow yourself to stay stuck in anger and bitterness after you leave the toxic environment of your relationship. Take time to spew all of the ugly hurt from your being so you won't carry it into a new union. This takes work and time to do this but is essential not to poison the new relationship with bad baggage from your past. It is a big decision to make whether or not to end a relationship that has been lengthy. Be sure and make a list of Pros and Cons of all the good and bad in the relationship currently. This list will help you determine whether you are being short-sighted and not seeing all the long-term good in the relationship, or whether it is more negative than good. This list will be a reinforcement for you to refer to later when your memory of circumstances has faded.